Those hose repair kits are great. I've used them to size hoses down to the length I want them. I just cut the hoses and add the kits to the ends. 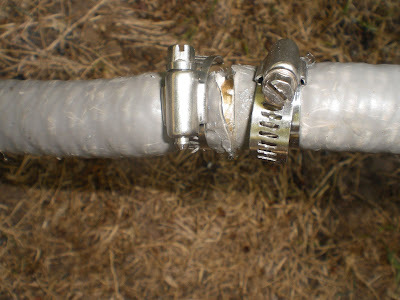 Also to fix a small leak you can stick a toothpick in the hole and break it off then apply duct tape to the outside. The toothpick expands out to fill the hole and the tape covers it all. Oh, I also hate it when store-bought items don't last as long as they are supposed to. Even worse when they are brand new! I don't know how far away your Costco is, but did you know that Costco has an awesome return policy that allows you to return pretty much anything at any time? Unless it's an electronic item on their list of 90-day limits, I think you can return the unsatisfactory item at any time for a full refund. LOL...that looks like every one of our hoses. Isn't it sad how manufacturers seem to be able to down right, flat out lie about their products? And when I do find something that works just right they stop making it because we supposedly need something new. For me, I wouldn't need all the variety and choices, I just want the one or two choices available to WORK. I'd be hauling them back to Costco and demanding my money back! I suppose you're like me, and don't keep the cardboard thingy that tells how long the warranty on them is, just assuming they will last as long as they say. I bought a heavy duty hose two years ago, and it sits out in 120 degree sun in AZ all summer, then gets hauled all winter by me, and it's still going strong (I hope). I wish I had such a good one here, rather than a bunch of cheapies that kink on me. Take them back to Costco! They take everything back. I would agree with every one else. I would take it back. It's nice to be able to fix the hose, but if it's new you shouldn't have to.